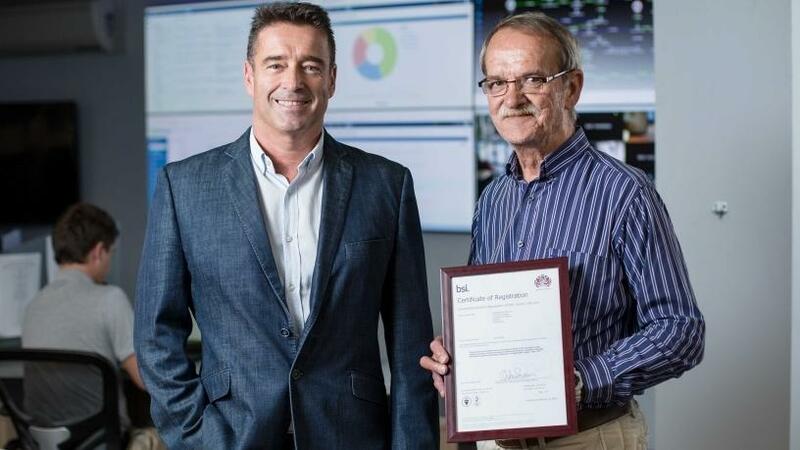 NEC XON has obtained ISO 27001 certification for its Cyber Defence Operations Centre (CDOC) and Network Operations Centre (NOC). Carel Coetzee (left), CEO of NEC XON, and Vernon Fryer, head of NEC XON's CDOC. The ISO 27001 standard encapsulates global cyber security best practice and, crucially, is a standard liability assurers both accept and increasingly demand from clients. "Our customers have peace of mind that their data is protected based on this verified, global standards-based certification," says Vernon Fryer, head of NEC XON's CDOC. "Many organisations now request some form of proof of how security services are delivered to both ensure they are protected and to satisfy legislative requirements." The primary legislation that drives the requirement is the Protection of Personal Information (POPI) Act and General Data Protection Regulation (GDPR), about to launch in the European Union (EU). "The regulations are designed to meet the reality many organisations face in terms of their rising cyber security exposure," says Carel Coetzee, CEO of NEC XON. "As a result of the risks, such as the high prevalence of ransomware, a growing number of companies are looking into information security insurance. One of the requirements from the liability underwriters is verified certification that meets global standards and regulatory requirements." NEC XON launched its CDOC, the only such facility from a single service provider in Africa, since it offers end-to-end physical and cyber defence services, with all the underlying IT infrastructure necessary for a turnkey solution, in November last year. NEC XON collaborates closely with Interpol and various other global crime-fighting organisations, and with several similar cyber centres across every continent. The CDOC and the NOC are a combination of specialist technologies and personnel who monitor cyber situations 24-7 in collaboration with other global experts. "The reality is that cyber threats today evolve so rapidly that you have to constantly be in touch and monitor multiple data and information sources to ensure you remain one step ahead of the criminals," says Fryer, who has 47 years of crime-fighting and cyber crime experience that includes the South Africa Police Service and Interpol. "The biggest threat enterprises face right now is ransomware, but the full range is extensive and covers everything from nation state actors to corporate espionage. "An ISO-based, verified, global standard is an extra layer that provides peace of mind at a time when it may seem few experts have the definitive solution to the cyber crime epidemic," he says. NEC XON is the combination of XON, a systems integrator providing custom ICT and security services and solutions in southern Africa since 1996, and NEC Africa, the African business of the global technology giant NEC Corporation. NEC Corporation implemented its first communication solution in Africa in 1963 and established NEC Africa in 2011 to grow its business ICT and public safety.